Brazilian riders dominated Mega Grand Prix, with Carlos Paixão winning Opens and sealing his second World Championship in a row. The semi-finals were an all-Brazilian affair showing the huge potential here; Brazil is chock-full of super-skilled athletes. 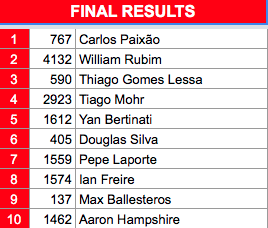 In the Final, Carlos Paixão took an early lead and kept it till the end, giving no chance to William Rubin (2nd), Thiago Lessa (3rd) or Tiago Mohr. Max Ballesteros has led the World title race for most of the race, but was eliminated here in the quarter-finals with a third place behind Pepe Laporte and Carlos Paixão. Douglas Dalua will soon graduate to the Master category, but showed he was still competitive, making it through to the semi-finals before being eliminated in a tight photo-finish with Carlos Paixão and Tiago Mohr. Jennifer Shauerte was sitting in second place in the World rankings, but had no luck here, going out in the semi behind Luana Chaves Dos Santos and Amanda Hartmann de Souza. Those two riders then moved into an all-Brazilian final with Melissa Brogni and Luana Campos. Melissa triumphed, followed by Luana Campos, Luana Chaves and Amanda. The Juniors race was tight but Jeremias Gasparotto won both his semi-final and the final, adding to his Juniors win in Costa Rica; it's clear that this 17 year-old rider is focused to make the move into Open Class for next year. The Masters category had a field of seven riders and featured the tightest battle of the day with only an inch separating Leonardo Discacciati from second-placed Rafael de Campos Dober. Leonardo (Monzin) Verardi had an easy win in Luge as he was the only competitor. With this victory, Carlos Paixão, as mentioned earlier, has sealed his second World Champion title in a row. Next weekend's 7 curves race will decide the other podium spots, and of course the South American championships, currently led by Douglas Dalua. I am Cyrille Harnay aka Komakino. I started Downhill racing in 2004. created the Bordeaux Longskate Club, organized hautacam freerides and Peyragudes Never Dies World Cup. Helped the IGSA as European Director and then created the IDF.